The integrity of our standards depends on a dedicated team of inspectors based in the countries where we operate—India, Nepal, and Afghanistan—who regularly visit our licensed manufacturers on a surprise, random basis. 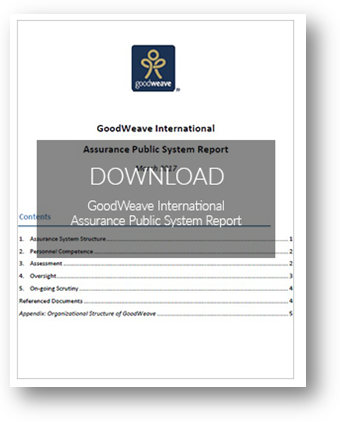 GoodWeave International’s Certification Division (GWI-CD) coordinates and oversees this team of inspectors, evaluates their findings, and implements the certification program that is at the heart of our work. To learn more about how GWI-CD operates—including the stipulations behind our licensing and certification policies, as well as information regarding fees, appeals, and confidentiality—click on the links below. To view more policies and procedures of GWI, please click here. Information on companies licensed by GoodWeave is available on country websites (see Where We Work) and Operator List for Afghanistan. Also available online is the list of De-licensed Companies (Excel). The Certification Committee is responsible for decision-making on licensing and certification. The Oversight Committee safeguards the impartiality of the certification program.